Members of the Beatles tribute band Eight Days A Week are pictured. 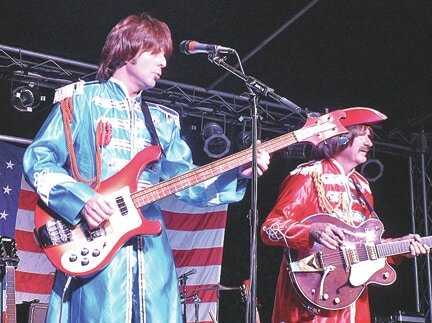 Eight Days A Week, a Beatles tribute band, will appear for a dinner and concert event on Saturday, July 11 at the Highland County Senior Citizens Center. Presale tickets are $15 and all proceeds will benefit the senior center. The doors open at 6 p.m. when a sit-down dinner of Sgt. Pepper’s chicken, green beans in butter cream sauce, potatoes, drinks and fresh fruit in a Jello mix with whipped cream will be served. Shortly before 7 p.m. Eight Days A Week, a Cincinnati-based band that’s performed throughout much of the country since 2001, will arrive at the senior center in Hillsboro – riding in a limo with screaming fans. “For people who were here for the Mark Twain event and saw him come down the street in a horse and buggy, that’s what it will be like,” Frost said. The music will start around 7 p.m. and the band will play for about 90 minutes, covering songs from the Beatles’ entire career. They’ll start out in the black suits and ties the Beatles wore during their early U.S. appearances, then during a brief intermission will switch to attire like the Beatles wore on the St. Pepper’s Lonely Hearts Club Band album cover. Tickets are on sale now at the senior center, open from 8 a.m. to 4 p.m. Monday through Thursday and 7 a.m. to 4 p.m. Fridays, and at the Merchants National Bank main branch in Hillsboro. Tickets at the door will be $18. “The Beatles are definitely part of our history and I thought it would be fun to have them here,” Frost said.